It's easy to dwell upon the one that got away from you. Perhaps there was a career opportunity that wasn't pursued because it didn't seem practical at the time, but you regret not taking a chance to open a new door. Maybe you skipped a concert because you felt like an outsider. These are just silly reasons that equate to missed moments that secretly gnaw at you. Almost three years ago, I planned to meet a friend after work. I needed her insight on a potential job opportunity. At the time I was a regular commuter on Metra's UP-West line, so the stop nearest to her home was three stops west of mine. The train passed Elmhurst, then Villa Park and then Lombard. When the train pulled away from Lombard, I grabbed my bag and moved toward the door. There was a thirtysomething man standing near the door with his eyes glued to his iPhone. Sure enough, on the back of his phone he had the Baltimore Orioles logo staring right at me. For about a year, I had been tracking the Major League Baseball team logos that I spotted out and about in the world (with specific limitations, of course). Looking back, I crossed roughly one dozen teams off of my list. Susan and I visited my sister in suburban D.C. earlier that summer. Due to close proximity, I assumed that I would have claimed the Washington Nationals and Orioles over the course of that weekend. Nope, just the Nats. My instinct was to slowly grab my iPhone and sneak a quick photo and call it a day. Being discrete seemed weird. I also considered telling the guy about my quest to find all 30 MLB logos. Perhaps I could pull up my blog and demonstrate that he held a missing puzzle piece. But that seemed even more awkward that stealing a photo. Next stop, Glen Ellyn. I stepped off of the train and walked away. Nearly three trips around the sun later, and it's been bothering me ever since. 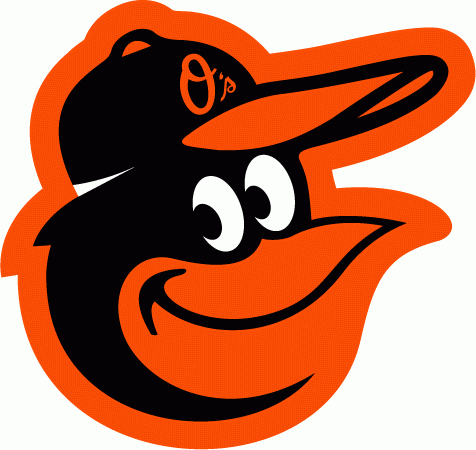 The Baltimore Orioles logo was the one that slipped away from me. I changed jobs a few months ago, so I commute via Prius once again. My drive is about 10-15 minutes one way back and forth on Butterfield Road from Route 83 to I-355. This morning, while stopped at the light at Meyers Road, I spotted a bright orange car. Not only did I spot a logo on the window, there was a second near the license plate. 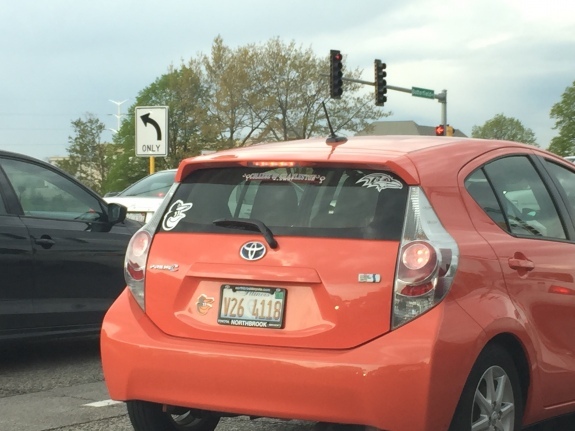 There were two Baltimore Orioles logos on one vehicle. For good measure, the driver had a Baltimore Ravens logo too. This was a Maryland guy through and through.